“Death and life are in the power of the tongue,” warns a proverbial inscription on a knife blade imagined by Francesco Salviati. 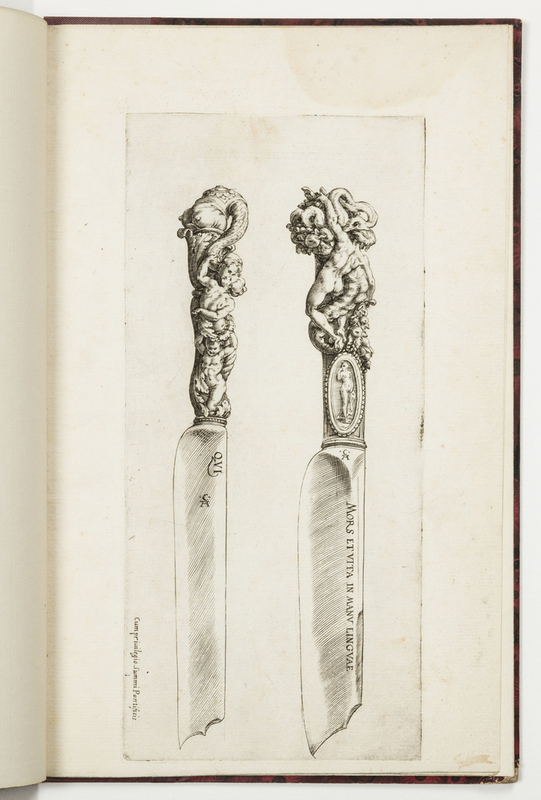 Knife handles further illustrate the tongue’s pleasures and perils, and these sensuous yet violent scenes seem to caution diners about to indulge. On one handle, a figure risks a snakebite to reach into a cornucopia of fruit. On the other, a woman holds her severed head in a serpentine arm as it kisses a recumbent lover. This decapitated torso, with its protuberant bust and scaly skin, could make even sworn carnivores queasy, but it suits a tool for slicing and chopping. Executed in precious metal, bone, or coral, these knives could have been used at a courtly banquet. But in the sixteenth century, as today, decadent dining could quickly turn gluttonous. Even kings were known to eat with their hands. In his cutlery, Salviati subversively weds the savage and carnal, tempting and testing our appetites. 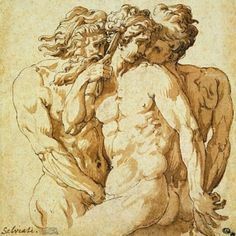 Salviati was trained from an early age in goldsmithing, and though he made his reputation as a painter, Giorgio Vasari writes that he maintained a lifelong ambition to sculpt, and cast small, “extremely witty and graceful” figures in bronze. In works like his 1550 deposition fresco for the Markgrafen Chapel in Rome’s Santa Maria dell’ Anima, or the below drawing of three nudes, his contorting figures seem to break through the flat picture plane, thrusting into a third dimension. Francesco Salviati, Untitled drawing, ca. 1545–1547. It’s fitting, then, that Salviati’s designs for cutlery take full advantage of every angle. Accentuating the S-curves of these earlier works, he twines torsos and tails around the axis of each handle, guiding the eye across its surface. As diners turned the knives over in their hands, more of the lascivious scene would reveal itself. This object and many more grotesques are included in the exhibition Fragile Beasts, which is on view at Cooper Hewitt through January 16, 2016. You can color your own creatures in the Fragile Beasts Coloring Book, available online at the Cooper Hewitt SHOP. Virginia McBride is a Curatorial Assistant in Cooper Hewitt’s Department of Drawings, Prints & Graphic Design. Sarah D. Coffin and Darra Goldstein, Feeding Desire: Design and the Tools of the Table, 1500–2005 (New York: Cooper Hewitt, Smithsonian Design Museum and Assouline Publishing, 2006), 38m 266. Vasari, Le Vite…, ed. 1996-87, vol. 5, quoted in “Francesco Salviati” in Linda Wolk Simon and Carmen C. Bambach, An Italian Journey: Drawings from the Tobey Collection, Corregio to Tiepolo (New York: Metropolitan Museum of Art and Yale University Press, 2010), 63.